Eli, a Brookies and Ursids student and ATL, writes about the white breasted nuthatch, sharing ways to identify the bird, as well as other interesting information! 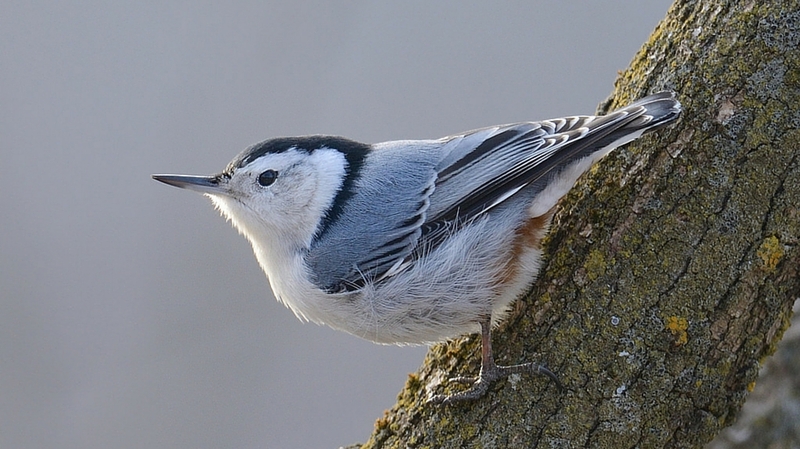 “The White Breasted Nuthatch is a very common bird and is found throughout the United States and Southern Canada in a variety of deciduous woodland habitats. It is often seen climbing down tree trunks head first foraging, Nuthatches are the only birds that commonly exhibit that behavior. White Breasted Nuthatches produce a loud, distinct ‘’yank, yank’’ call as well as a ‘’er, er call’’. Both calls are easily heard and can pierce through dense woodland vegetation with ease. They do not display sexual dimorphism, with both males and female exhibiting the same white and blue plumage. The black cap on the head, the white underside, and the little blue back are all good identifying marks for the White Breasted Nuthatch. White Breasted Nuthatches are very opportunistic and will feed on a large variety of insects and seeds. They frequently visit backyard bird feeders, and they are often seen feeding on suet feeders. White Breasted Nuthatches are careful when approaching feeders, and they often stop on branches around the feeder to make sure it is safe. The White Breasted Nuthatch is cavity nester often making its nest in dead trees, and will sometimes construct nests in bird boxes. The eggs are white with dark markings, and they are laid in clutches of 3 to 10. After a 12 day incubation period, the eggs hatch, and after two weeks in the nest, the young fledge. The fledglings do not reach breeding age until they are one or two years of age.